What Dynamic Seating is Kylie using now? On her power chair, Kylie uses a Seating Dynamics Dynamic Rocker Back interface (DRBi), Seating Dynamics Dynamic Footrests and a Stealth Products Dynamic Head Support (tone deflector). 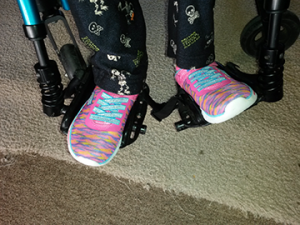 On her manual wheelchair, Kylie has Miller’s dynamic coil springs on her footrest hangers. How has Dynamic Seating helped Kylie? “Before Kylie got the Dynamic Footrests, she was constantly breaking her footrests. 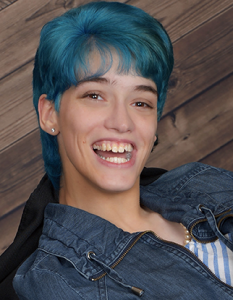 She was fracturing pieces of metal and everyone kept telling us ‘this shouldn’t happen.’ Getting the dynamic footrests has cut down on trips to the supplier for repairs.” Kylie and her Mom must drive to Denver for repairs, a trip that takes about 3 hours. “Kylie used to get pressure sores on her heels and the inside of her feet. We had to use corn pads and she had to wear really good shoes (athletic shoes) to protect her feet. With the dynamic footrests, we don’t have to use the corn pads and she can wear any shoes she wants without pressure concerns.” Kylie is a styling young woman who likes her shoes! Have you noticed any drawbacks to using Dynamic Seating? “The dynamic piece on her manual wheelchair footrest hangers is bent and doesn’t allow her to move.” Kylie’s tone is so strong, that she has actually bent these coil springs on the manual wheelchair (see photo below). As a result, her feet and legs are not positioned optimally. She will be receiving Seating Dynamics Dynamic Footrests soon for this chair. Dynamic Seating can diffuse force, protect the wheelchair from breakage, improve function and comfort and even allow someone to wear the shoes they want!